For the second book in the Ladies’ Fashionable Cabinet trilogy, I wanted to get more involved in the actual business of magazine publication during the early 19th century. Because of my personal interest in fashion prints, I especially wanted to integrate the production of prints into the story. Among my large collection of fashion prints are several duplicates, and some of these vary widely in their hand-coloring. 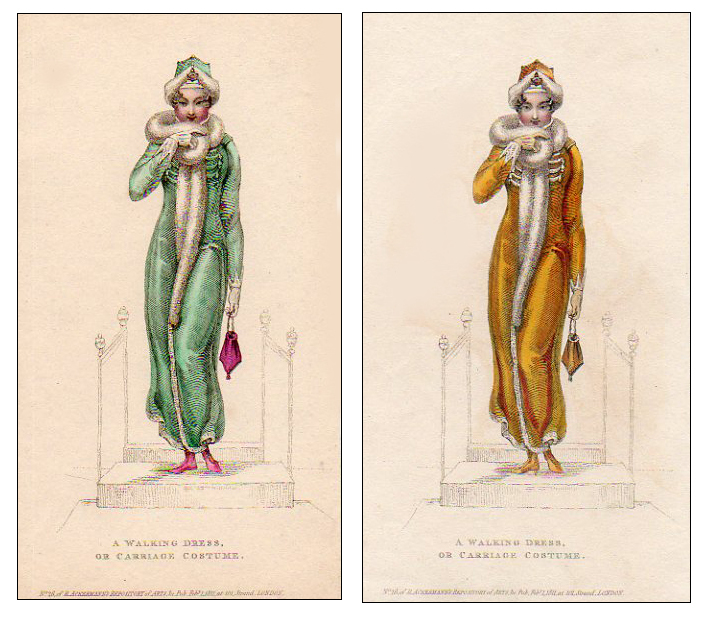 The same dress will be green in one print and gold in another (as in the examples from Ackermann’s Repository of Arts, below, from February 1811, showing a “Walking Dress or Carriage Costume”). The same pair of slippers might be plain in one print and striped in another. Could the variations in coloring be a result of subsequent painting by the prints’ owners? There was only one magazine I am aware of that issued fashion prints in black and white. That was La Belle Assemblée, which offered issues with either colored or uncolored prints during its first few years of publication. So, any notion of subsequent coloring could only be true with those early black and white LBA prints. In other magazines, like Ackermann’s Repository of Arts, all prints were issued in color, so when we find wide variation in the use of color, it poses several questions. In the print shown above, for example, the accompanying description in the magazine refers to the pelisse as “amber coloured velvet.” The reticule (purse) and shoes are also described as amber. So how did the other print end up with a green pelisse and pink shoes? I began to wonder about the colorists who painted the prints, many of whom were most likely young women paid a pittance to color hundreds of prints. Were they simply asserting their own style and opinion in the choice of colors? Were they given no particular instructions as to color in certain prints, and therefore made the decisions on their own? Or were they perhaps illiterate and unable to read the accompanying descriptions? For the sake of the story, I decided it would be more interesting if the differences in coloring were a result of illiteracy. Taking the idea a step further, what if the colorists were not only illiterate, but horribly tacky, with no sense of style or color? And so the Crimson Ladies were born. The hand colorists in Once a Scoundrel are street prostitutes brought in by the notorious new fashion editor. The Crimson Ladies’ somewhat vulgar notion of color produces wildly varying and boldly colored prints. In more ways than one, they bring a bit of color into the production of the magazine. I hope you’ll enjoy reading about them.